The CD201 system manages to combines all the important aspects of a good sub/sat system - solid build, ease of use and attractive looks. Attractive if you like aluminium. It dominates the enclosure of the main five speakers, and it's used for the 25mm tweeters, 110mm mid/bass drivers, as well as the 220mm bass unit in the powered subwoofer. All the tin-can satellites are sealed boxes, so there's no bass boosting ports in the enclosures to slow the sound down. The CD250 centre speaker is a 'two-and-a-half way' design, with a pair of mid/bass units flanking the tweeter. In contrast, the front and rear CD220 satellites are standard two-way designs, with a single treble and mid/bass unit. But they are also exceptionally well built and the mounting brackets fit snugly and solidly (there are optional stands, too). Also, the speaker terminals accept bare wire but not 4mm banana plugs or spade lugs, so the use of fancy terminated speaker wire isn't an option. The AS80SC subwoofer is more straightforward, a silver-finished MDF cube with a front-firing port beneath the 220mm aluminium bass driver. There's a 150W built-in amplifier and the whole thing weighs a healthy 11.7kg. We found the best position for the crossover was set rather high - although the speakers notionally work down to 40Hz, the subwoofer was best rolled in at around 110Hz or so. But the sealed satellites have an advantage over their ported peers, as they are seemingly unfussed by positioning. If you want the speakers out in the room, or pushed up against the walls, there's not a great deal of difference sonically, aside from a thickening of speech when used close to the room's corners. The subwoofer, in contrast, needs more careful positioning, ideally half a metre or more from the back wall and in line with the centre speaker. 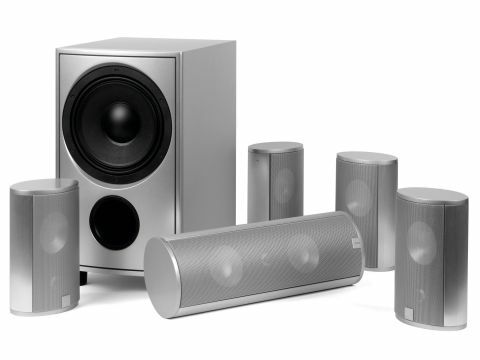 These are some of the fastest speakers you'll hear: sounds are crisp and ordered and precise. All that speed does have a trade-off, as the bass end of things, although deep, is not the thing for those after a lot of boomy oomph. There's a useful lift in the bass that makes the sound seem bigger than you'd expect, but those who want to hear the subwoofer in film action may be disappointed. This shouldn't be overstated, though. The bass is well integrated with the rest of the sound (it's a little more sluggish than the superfast satellites, but not by much) and the whole package is well integrated and plays to the head as much as the heart.